Announcement Welcome to Jakes Custom Knives. My name is Jake Fowler. I'm 23 years old and love creating functional pieces of art, mainly High Quality Customized Knives. I also love filming my projects and posting them on my youtube channel Jakes Custom Knives. You can choose any knife listed on Etsy and it will get shipped promptly. Welcome to Jakes Custom Knives. My name is Jake Fowler. I'm 23 years old and love creating functional pieces of art, mainly High Quality Customized Knives. I also love filming my projects and posting them on my youtube channel Jakes Custom Knives. You can choose any knife listed on Etsy and it will get shipped promptly. I am a 4th Generation plumber! These master pieces are definitely one of a kind ! True craftsmanship and awesome creation from a simple pipe wrench jaw to an awesome blade I highly recommend this blacksmith and his craftsmanship!!!! Thanks!! Some of the most recent custom file knives I made. Entrance into the Custom File Knife Shop. The shop could stand a little updating, but its what's inside that counts. Side view of the grinding room (minus the Jet grinder) where I spend a lot of time. Heading out on a 3 day 23 mile long survival trip to field test a few knife designs in the great outdoors. Testing out a few throwing knife designs and styles outside the Custom File Knife Shop. Hello and welcome to the Custom File Knives Shop. My name is Jake Fowler and I love making custom one-of-kind knives. I'm 20 years old and have had a passion for making high quality, super sharp unique knives for as long as I can remember. I'm not really into making a portfolio of knife designs for sale, but instead every single knife I make is 100% completely unique down to the last detail. All my knives have a functional purpose and built to last a life time, but I also enjoy adding additional details to make them (hopefully) look like a functional piece of art. I'll be listing some of the knives I currently have for sale on Etsy, along with a variety of custom made micarta knife handle scales for those who would like to make their own custom knife. If you're making a custom knife and need a little help with the process, I would be more than happy to help you any way I can. You can also check out my Blog at CustomFileKnives.com where I'm starting to post a lot of what goes into making a quality custom knife. Also, as much as I love creating new knife designs I've come up with, I really love making a true custom knife specifically made for the customer. If you can draw it, I can make it. 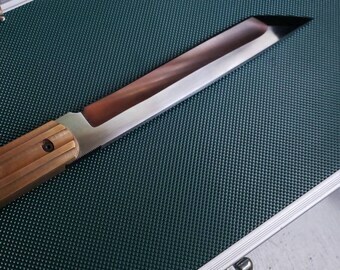 The design and colors used for the knife handle are limited only by your imagination. If you ever thought about having a custom knife made just for you, I would be more than happy to discuss a few ideas with you. Please check out my store for more details. 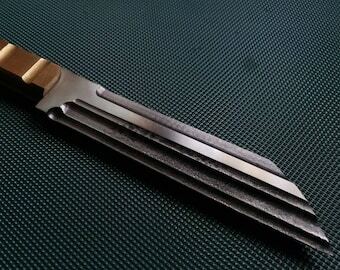 Jake Fowler is the owner/operator of CustomFileKnives.com. I'm 20 years old and always had a passion for making quality custom knives. Every knife is 100% custom made down to the last detail. Have an idea for your own custom knife? Let's talk! My shop policies are simple. Every single item I sell comes with a 100% guarantee that you will be happy with your purchase. I don't want a single knife I made in someone's hands that is not happy with their purchase. 100% Satisfaction Guaranteed. If you don't like your knife then simply return it within 15 days in the same condition for a full refund.